Pyrotect’s New ProSport SA2010Helmets have been designed for increased safety, comfort and unmatched quality at an affordable price. 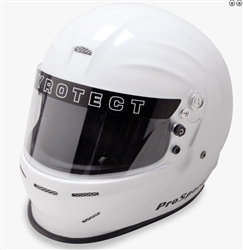 The clean aerodynamic design, along with our P1 venting system, provides superior air circulation throughout the helmet interior. Our shield/pivot system is superior to any helmet in our price range. ProSport helmets are approved for all major racing Associations.